Andrew's first wife, Gertrude of Merania, was murdered in 1213 because her blatant favoritism towards her German kinsmen and courtiers stirred up discontent among the native lords. The veneration of their daughter, Elizabeth of Hungary, was confirmed by the Holy See during Andrew's lifetime. After Andrew's death, his sons, Béla and Coloman, accused his third wife, Beatrice d'Este, of adultery and never considered her son, Stephen, to be a legitimate son of Andrew. [All] the magnates of the kingdom and almost the whole of the Hungarian army deserted [King Emeric] and unlawfully sided with Duke Andrew. Very few men indeed remained with the king, and even they were terrified at the extent of the insurrection and did not dare to urge the king to hope for success, but rather advised him to flee. Then it happened that one day both sides had drawn close to each other and were beginning to prepare themselves in earnest for battle. ... [After] much wise thought, with inspiration from heaven [King Emeric] found a successful way by which he might recover his right to the kingdom and still remain guiltless of bloodshed. So he said to his men, "Stay here a while, and do not follow me." Then he laid down his weapons, and taking only a leafy bough in his hand he walked slowly into the enemy ranks. As he passed through the midst of the armed multitude, he cried out in a loud and strong voice, "Now I shall see who will dare to raise a hand to shed the blood of the royal lineage!" Seeing him, all fell back, and not daring even to mutter, they left a wide passage for him on either side. And then when [King Emeric] reached his brother, he took him, and leading him outside the body of troops, he sent him to a certain castle for custody. When he returned to Hungary, Andrew complained to Pope Honorius that his kingdom was "in a miserable and destroyed state, deprived of all of its revenues." A group of barons had even expelled Archbishop John from Hungary. Andrew was in massive debt because of his crusade, which forced him to impose extraordinarily high taxes and debase coinage. In 1218 or 1219, Mstislav Mstislavich invaded Halych and captured Andrew's son, Coloman. Andrew compromised with Mstislavich. Coloman was released, and Andrew's youngest son and namesake was betrothed to Mstislavich's daughter. In 1220, a group of lords persuaded Andrew to make his eldest son, Béla, the Duke of Croatia, Dalmatia and Slavonia. Andrew employed Jews and Muslims to administer royal revenues, which caused a discord between Andrew and the Holy See starting in the early 1220s. Pope Honorius urged Andrew and Queen Yolanda to prohibit Muslims from employing Christians. Andrew confirmed the privileges of clergymen, including their exemption from taxes and their right to be exclusively judged by church courts, but also prohibited the consecration of udvornici, castle folk and other serfs in early 1222. However, a new conflict emerged between Andrew and the Holy See after he persuaded Béla to separate from his wife, Maria Laskarina. An "immense crowd" approached Andrew around June 1222, demanding "grave and unjust things", according to a letter of Pope Honorius. Actually, the royal servants—who were landowners directly subject to the monarch's power and obliged to fight in the royal army—assembled, forcing Andrew to dismiss Julius Kán and his other officials. Andrew was also forced issue a royal charter, the Golden Bull of 1222. The charter summarized the liberties of the royal servants, including their exemption from taxes and the jurisdiction of the ispáns. 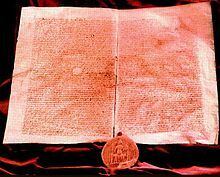 The last clause of the Golden Bull authorized "the bishops as well as the other barons and nobles of the realm, singularly and in common" to resist the monarch if he did not honor the provisions of the charter. The Golden Bull clearly distinguished the royal servants from the king's other subjects, which led to the rise of the Hungarian nobility. The Golden Bull is commonly compared with England's Magna Carta — a similar charter which was sealed a few years earlier in 1215. A significant difference between them is that, in England, the settlement strengthened the position of all the royal subjects but, in Hungary, the aristocracy came to dominate both the crown and the lower orders. Andrew discharged Palatine Theodore Csanád and restored Julius Kán in the second half of 1222. The following year, Pope Honorius urged Andrew to launch a new crusade. If the report of the Continuatio Claustroneuburgensis is reliable, Andrew took the cross to show that he intended to launch a new crusade, but no other sources mention this event. Andrew planned to arrange a new marriage for his eldest son, Béla, but Pope Honorius mediated a reconciliation between Béla and his wife in the autumn of 1223. This angered Andrew, and Béla fled to Austria. He returned in 1224 after the bishops persuaded Andrew to forgive him. In his Diploma Andreanum of 1224, Andrew confirmed the privileges of the "Saxons" who inhabited the region of Hermannstadt in southern Transylvania (now Sibiu, Romania). The following year, he launched a campaign against the Teutonic Knights, who had attempted to eliminate his suzerainty. The Knights were forced to leave Barcaság and the neighboring lands. Andrew's envoys and Leopold VI of Austria signed a treaty on 6 June, which ended the armed conflicts along the Hungarian-Austrian border. As part of the treaty, Leopold VI paid an indemnification for the damages that his troops had caused in Hungary. Andrew made his oldest son, Béla, Duke of Transylvania. Béla's former duchy was given to Andrew's second son, Coloman, in 1226. Duke Béla started expanding his suzerainty over the Cumans, who inhabited the lands east of the Carpathian Mountains. Andrew launched a campaign against Mstislav Mstislavich in 1226 because the latter refused to grant Halych to Andrew's youngest son despite a previous compromise. Andrew besieged and captured Przemyśl, Terebovl, and other fortresses in Halych. However, his troops were routed at Kremenets and Zvenigorod, forcing him to withdraw. Despite his victories, Mstislavich ceded Halych to Andrew's son in early 1227. ^ a b Kontler 1999, p. 75. ^ a b Kristó & Makk 1996, p. 229, Appendix 4. ^ Kristó 1994, p. 43. ^ a b c d e f Almási 2012, p. 86. ^ a b Kristó & Makk 1996, p. 229. ^ Dimnik 2003, p. 191. ^ a b c Kristó & Makk 1996, p. 224. ^ Dimnik 2003, pp. 191, 193. ^ a b c d e Dimnik 2003, p. 193. ^ a b c d e f g Érszegi & Solymosi 1981, p. 127. ^ a b c Engel 2001, p. 54. ^ a b Dimnik 2003, pp. 193–194. ^ Érszegi & Solymosi 1981, p. 122. ^ Berend, Urbańczyk & Wiszewski 2013, p. 249. ^ Berend, Urbańczyk & Wiszewski 2013, p. 234. ^ a b c Érszegi & Solymosi 1981, p. 124. ^ a b c d Curta 2006, p. 347. ^ Fine 1994, p. 22. ^ Curta 2006, p. 370. ^ Bárány 2012, p. 132. ^ Érszegi & Solymosi 1981, pp. 124–125. ^ a b c d e Érszegi & Solymosi 1981, p. 125. ^ a b c Kristó & Makk 1996, p. 230. ^ a b c Érszegi & Solymosi 1981, p. 126. ^ Archdeacon Thomas of Split: History of the Bishops of Salona and Split (ch. 23. ), pp. 141–143. ^ a b c d e Engel 2001, p. 89. ^ Archdeacon Thomas of Split: History of the Bishops of Salona and Split (ch. 23. ), p. 143. ^ a b Kristó & Makk 1996, pp. 227, 231. ^ Kristó & Makk 1996, pp. 227–228. ^ Bartl et al. 2002, p. 31. ^ a b c d Engel 2001, p. 91. ^ a b c Berend, Urbańczyk & Wiszewski 2013, p. 427. ^ Engel 2001, pp. 91–92. ^ Engel 2001, p. 93. ^ Dimnik 2003, pp. 251–253. ^ Dimnik 2003, pp. 253–254. ^ a b Berend, Urbańczyk & Wiszewski 2013, p. 441. ^ Dimnik 2003, pp. 254–255, 258. ^ a b c d Dimnik 2003, p. 263. ^ The Hypatian Codex II: The Galician-Volynian Chronicle (year 1207), p. 19. ^ Bárány 2012, p. 136. ^ a b c d e Érszegi & Solymosi 1981, p. 128. ^ Dimnik 2003, pp. 263–264. ^ Dimnik 2003, p. 264. ^ The Hypatian Codex II: The Galician-Volynian Chronicle (year 1210), p. 20. ^ a b Kristó & Makk 1996, p. 233. ^ Engel 2001, pp. 90–91. ^ Kristó & Makk 1996, pp. 232–233. ^ a b c Berend, Urbańczyk & Wiszewski 2013, p. 428. ^ Almási 2012, p. 88. ^ Kristó & Makk 1996, pp. 232–234. ^ Anonymus, Notary of King Béla: The Deeds of the Hungarians (ch. 9), p. 27. ^ Kristó & Makk 1996, p. 234. ^ a b Magaš 2007, p. 58. ^ Fine 1994, p. 149. ^ a b c Érszegi & Solymosi 1981, p. 129. ^ a b c d Dimnik 2003, p. 266. ^ The Hypatian Codex II: The Galician-Volynian Chronicle (year 1211), p. 20. ^ a b Kristó & Makk 1996, p. 236. ^ Curta 2006, p. 385. ^ Spinei 2009, p. 145. ^ a b c d e f g Érszegi & Solymosi 1981, p. 131. ^ Spinei 2009, pp. 145–146. ^ Engel 2001, p. 90. ^ Curta 2006, p. 404. ^ a b c d e f g h Érszegi & Solymosi 1981, p. 130. ^ Dimnik 2003, p. 272. ^ a b c Berend, Urbańczyk & Wiszewski 2013, p. 429. ^ a b c d e f g Engel 2001, p. 94. ^ Almási 2012, p. 89. ^ Engel 2001, p. 92. ^ Berend, Urbańczyk & Wiszewski 2013, pp. 427–428. ^ a b Érszegi & Solymosi 1981, p. 132. ^ a b c Bárány 2012, p. 143. ^ a b Fine 1994, pp. 105–106. ^ a b Fine 1994, p. 108. ^ Bárány 2013, p. 462. ^ a b c d Van Cleve 1969, p. 387. ^ a b c Runciman 1989b, p. 146. ^ Almási 2012, p. 87. ^ Bárány 2013, p. 463-465. ^ Almási 2012, pp. 87–88. ^ Bárány 2013, p. 463. ^ a b c d Érszegi & Solymosi 1981, p. 133. ^ Sterns 1985, p. 358. ^ a b c d e Van Cleve 1969, p. 393. ^ a b Runciman 1989b, pp. 148–149. ^ a b Archdeacon Thomas of Split: History of the Bishops of Salona and Split (ch. 25. ), p. 165. ^ Richard 1999, p. 298. ^ Van Cleve 1969, pp. 388, 393. ^ a b c d Kristó & Makk 1996, p. 238. ^ Bárány 2012, p. 148. ^ Fine 1994, p. 129. ^ a b Van Cleve 1969, p. 394. ^ a b Érszegi & Solymosi 1981, p. 134. ^ Dimnik 2003, pp. 289–290. ^ Berend, Urbańczyk & Wiszewski 2013, p. 425. ^ Engel 2001, pp. 96–97. ^ a b Berend 2006, p. 152. ^ Érszegi & Solymosi 1981, p. 135. ^ Bartl et al. 2002, pp. 30–31. ^ a b Bárány 2012, p. 150. ^ Engel 2001, pp. 85, 94. ^ Berend, Urbańczyk & Wiszewski 2013, pp. 428–429. ^ Ertman 1997, p. 273. ^ Ertman 1997, pp. 273–4. ^ a b Bárány 2012, p. 151. ^ a b Curta 2006, p. 403. ^ Engel 2001, p. 114. ^ a b c d e f Érszegi & Solymosi 1981, p. 138. ^ Curta 2006, pp. 405–405. ^ Engel 2001, p. 95. ^ a b c Érszegi & Solymosi 1981, p. 139. ^ Érszegi & Solymosi 1981, p. 140. ^ Berend 2006, p. 155. ^ a b c Érszegi & Solymosi 1981, p. 141. ^ Berend 2006, pp. 154–155. ^ a b Berend 2006, p. 157. ^ a b c Érszegi & Solymosi 1981, p. 142. ^ a b c Érszegi & Solymosi 1981, p. 143. ^ Berend 2006, pp. 158–159. ^ Kristó & Makk 1996, p. 243. ^ a b Berend 2006, p. 160. ^ a b c d Érszegi & Solymosi 1981, p. 144. ^ Engel 2001, p. 98. ^ Kristó & Makk 1996, p. 244. ^ Kristó & Makk 1996, p. 229, Appendices 2–4. ^ Runciman 1989a, p. 345, Appendix III. ^ Hamilton 2000, p. 104. ^ Dimnik 1994, pp. 85, 95. ^ Kristó & Makk 1996, p. 231. ^ a b c d Kristó & Makk 1996, p. 232, Appendix 4. ^ Engel 2001, p. 97. ^ Kristó & Makk 1996, pp. 236–237. ^ Kristó & Makk 1996, p. Appendix 4. ^ Kristó & Makk 1996, p. 243, Appendix 4. ^ Kristó & Makk 1996, pp. 243, 282, Appendix 4. ^ a b Kristó & Makk 1996, p. 282. The Hypatian Codex II: The Galician-Volynian Chronicle (An annotated translation by George A. Perfecky) (1973). Wilhelm Fink Verlag. LCCN 72-79463. Almási, Tibor (2012). "II. András". In Gujdár, Noémi; Szatmáry, Nóra (eds.). Magyar királyok nagykönyve: Uralkodóink, kormányzóink és az erdélyi fejedelmek életének és tetteinek képes története [Encyclopedia of the Kings of Hungary: An Illustrated History of the Life and Deeds of Our Monarchs, Regents and the Princes of Transylvania] (in Hungarian). Reader's Digest. pp. 86–89. ISBN 978-963-289-214-6. Bárány, Attila (2012). "II. András balkáni külpolitikája [Andrew II's foreign policy in the Balkans]". In Kerny, Terézia; Smohay, András (eds.). II. András and Székesfehérvár [Andrew II and Székesfehérvár] (in Hungarian). Székesfehérvári Egyházmegyei Múzeum. pp. 129–173. ISBN 978-963-87898-4-6. Bárány, Attila (2013). "II. András és a Latin Császárság [Andrew II and the Latin Empire of Constantinople]". Hadtörténelmi Közlemények (in Hungarian). 126 (2): 461–480. ISSN 0017-6540. Berend, Nora (2006). At the Gate of Christendom: Jews, Muslims and "Pagans" in Medieval Hungary, c. 1000–c.1300. Cambridge University Press. ISBN 978-0-521-02720-5. Dimnik, Martin (1994). The Dynasty of Chernigov, 1054–1146. Pontificial Institute of Mediaeval Studies. ISBN 0-88844-116-9. Ertman, Thomas (1997). Birth of the Leviathan: Building States and Regimes in Medieval and Early Modern Europe. Cambridge University Press. ISBN 9780521484275. Kristó, Gyula (1994). "II. András". In Kristó, Gyula; Engel, Pál; Makk, Ferenc (eds.). Korai magyar történeti lexikon (9–14. század) [Encyclopedia of the Early Hungarian History (9th–14th centuries)] (in Hungarian). Akadémiai Kiadó. p. 43. ISBN 963-05-6722-9. Richard, Jean (1999). The Crusades, c. 1071–c. 1291. Cambridge University Press. ISBN 0-521-62566-1. Runciman, Steven (1989a). A History of the Crusades, Volume II: The Kingdom of Jerusalem and the Frankish East 1100–1187. Cambridge University Press. ISBN 0-521-06162-8. Sterns, Indrikis (1985). "The Teutonic Knights in the Crusader States". In Setton, Kenneth M.; Zacour, Norman P.; Hazard, Harry (eds.). A History of the Crusades, Volume V: The Impact of the Crusades on the Near East. The University of Wisconsin Press. pp. 315–378. ISBN 0-299-09140-6. Wikimedia Commons has media related to Andrew II of Hungary.